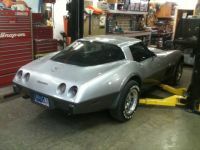 BIG HEMI CUSTOMS PROJECT: 1978 CHEVY CORVETTE. The Corvette was 25 years old in 1978 and the celebration was on. All 1978s featured a commemorative badge (right) on the front nose. A special two tone paint scheme consisting of dark silver on the lower body and light silver above separated by a dark silver stripe was offered. The production quantity was not limited and 15,283 were sold. 1978 was a year of significant changes to the C3 Corvette. A new “fastback” design which made for a smoother silhouette and answered criticisms of limited luggage space; owners now had storage similar to the mid-years Corvette coupes. Also like the mid-years coupes, access to the area was through the seats and inconvenient. A hatchback opening would be available in 1982. A retractable cover provided sun protection and security. One drawback to the new design was that the interior would heat up on sunny days, placing increased demands on the air conditioning.